Cloud Computing caught Classic Empire in the final strides to win the Preakness in an upset. Ridden by Javier Castellano, 13-1 long shot Cloud Computing ran 1 3/16 miles in 1:55.98. Classic Empire dueled with Kentucky Derby winner Always Dreaming throughout most of the race before taking the lead turning for home. It looked as if Classic Empire was going to win, but Cloud Computing came after him on the outside and beat him to the wire. World Approval has won the $250,000 Dixie, the oldest stakes race held at Pimlico Race Course. The 5-year-old gray beat Projected by 2 1/4 lengths Saturday, improving his record to eight wins in 20 starts. The victory pushed his career earnings over $1.1 million. World Approval paid $7 to win. He ran the 1 1/16 miles in 1:43.15 on the turf. The winning Dixie team of trainer Mark Casse and jockey Julien Leparoux will team up in the Preakness with Classic Empire. 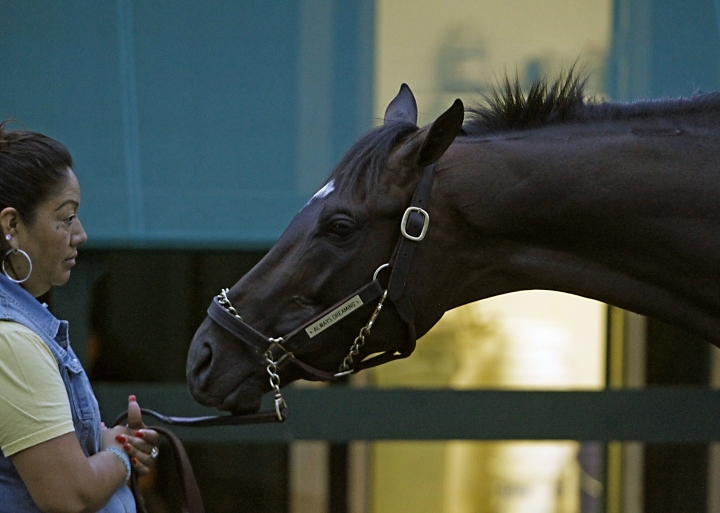 With less than an hour until post time, Kentucky Derby winner Always Dreaming is the 7-5 favorite for the Preakness. Always Dreaming was 4-5 on the morning line set Wednesday. Classic Empire, who finished fourth two weeks ago at Churchill Downs, is the 2-1 second choice followed by Derby runner-up Lookin At Lee at 8-1 and Conquest Mo Money at 9-1. Every other horse in the field has double-digit odds to win. No Mo Dough survived a lengthy stewards' inquiry to win the $100,000 Sir Barton Stakes for 3-year-olds at Pimlico. Angled extremely wide by jockey Jose Ortiz turning for home, No Mo Dough cut sharply to the inside while launching his rally. The stewards ruled that no other runners were impeded by the move, and let the result stand. No Mo Dough rolled to a 2 3/4-length victory over Time to Travel. He paid $20 to win for the 9-1 upset. It was the third win in four races for the colt making his stakes debut and it gave trainer Graham Motion his second win of the day. Whitmore has found a home in sprint races. A Triple Crown contender last year who finished 19th in the Kentucky Derby, Whitmore is 5 for 5 since shortening up to six furlongs. He surged in the final strides to beat A.P. Indian by a half-length Saturday in the $150,000 Maryland Sprint Stakes at Pimlico. Trained by Ron Moquett, the 4-year-old gelding was ridden by Ricardo Santana Jr. He covered the distance in 1:09.90 and paid $4.40 to win as the 6-5 favorite. In the $150,000 Gallorette Stakes for fillies and mares, Cambodia has earned her first stakes victory. The 5-year-old ridden by Florent Geroux patiently stalked the pace set by 66-1 longshot Come to Mischief. Cambodia sprinted away from that tiring rival in the lane, powering to a two-length win over On Leave in the turf race. Trained by Tom Proctor, Cambodia got her fourth win in 10 starts. She paid $11.20 to win. The time was 1:44.35 for 1 1/16 miles. Rain that fell Friday afternoon muddied up the main track at Pimlico, but it's expected to be fast by the time the Preakness goes off around 6:48 p.m. The track was listed as "muddy" for the first few races of the day and upgraded to "good" by the time Race 9 went off. Maryland Jockey Club president and general manager Sal Sinatra said he was pretty confident the track would be upgraded to "fast" even without sun to dry it out. "It's drying out pretty good," Sinatra said. "I got here this morning and there was a lot of water on it. I think we're in good shape." Recruiting Ready has extended his winning streak to three in a row with a 3¾-length victory in the $200,000 Chick Lang Stakes for 3-year-old sprinters at Pimlico. It was also the third win on Saturday for jockey Horacio Karamanos. Recruiting Ready improved his overall record to 4 for 9 for trainer Horacio DePaz. The colt paid $7.40 to win after running six furlongs in 1:10.35. Aquamarine, trained by Hall of Famer D. Wayne Lukas, rallied up the rail to get second. 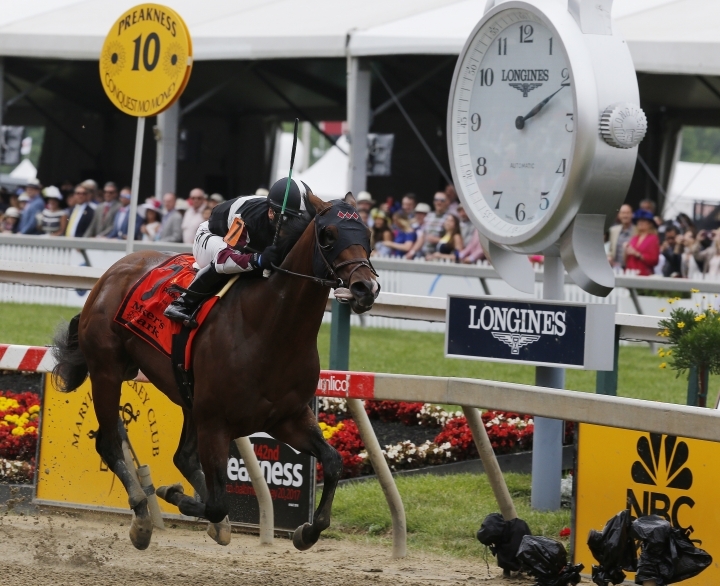 Yoshida added some international flair to the Preakness day undercard with a four-length victory in the $100,000 James W. Murphy Stakes for 3-year-olds on the turf. The Japan-bred colt got his second win in three starts, all in the U.S., for Hall of Fame trainer Bill Mott. Ridden by Joel Rosario, Yoshida paid $7.60 to win. He ran a mile in 1:36.83. Support has softened for Kentucky Derby winner Always Dreaming in early wagering for the Preakness. 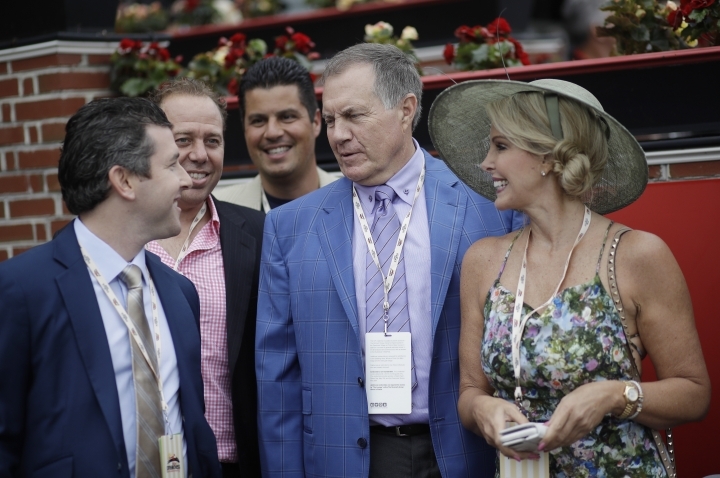 After opening as the 1-5 favorite on Friday, the colt's odds have drifted up to 3-2, which translates into roughly a $5 win payoff for each $2 wager. Classic Empire, who was fourth in the Kentucky Derby, is giving the favorite a run for his money as the 2-1 second choice. Lookin At Lee, the fast-closing runner-up in the Derby, is third choice at 8-1. Conquest Mo Money, expected to vie with Always Dreaming on the early lead, is fourth choice at 9-1. The other six horses are all at double-digit odds. This is not your father's Preakness Day infield. Heck, it's not even your big brother's infield. A food court? A DJ spinning electronic dance tunes? No lines for beer? It's been a long time since fans were allowed to bring their own kegs into Pimlico on the day of the Preakness. Now, fans can receive endless refills of modestly sized mugs or buy drinks of Jack Daniel's whiskey at $10 a pop. The change has certainly made it a safer environment. But it's also much more drab than in the crazy days when the infield mascot was named "Kegasus." Instead of breaking legs running over portable toilets, the millennials are buying turkey legs. Oh, and there's this: More people are vaping than smoking cigars. Everything Lovely has kicked off the Preakness Stakes undercard with a front-running victory in the $100,000 Very One for filly and mare turf sprinters at Pimlico. The 5-year-old trained by Kate Demasi grabbed hold of the softened course rated good Saturday following heavy rain a day earlier. It was her sixth win in 20 starts, and a sharp rebound from last year when she finished 11th in this race. Javier Castellano was aboard for the five furlongs in 57.93 seconds. Everything Lovely held off Sunnysammi by a length and paid $7.80 to win. The infield party is in full swing ahead of the 142nd running of the Preakness Stakes at Pimlico in Baltimore. Country singer Sam Hunt and electro house music DJ Zedd are co-headlining the pre-race concert under cloudy skies. Also on the bill is Good Charlotte. The racetrack is listed as muddy after Friday's rainstorm. After three straight days of 90-degree weather, Saturday's high is 66 degrees (18 C). The U.S. Army Golden Knights will parachute, the B-2 Stealth bomber is set for a flyover and the Budweiser Clydesdales will parade later on.